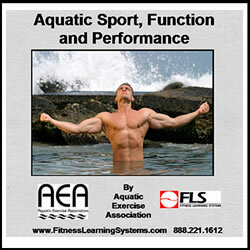 Whether designing aquatic programming for the professional athlete, the “armchair” athlete, or somewhere in between, this course will provide numerous options for improving performance and functional capabilities using creative and carefully developed aquatic exercise. The focus is on formatting for optimum efficiency in relation to a variety of student goals: sports related, recreational activity, or daily function. Participant goals, muscle involvement and equipment interaction are considered, along with movement patterns to improve performance and enhance exercise retention at any level of activity or sport.